Inside the O’Briens was not my first introduction to Huntington’s disease. I remember learning about it in my high school biology class when we studied genetics. I couldn’t remember all the symptoms though and only knew that it was passed down from either your mom or dad leaving you with a 50% chance of getting it. I didn’t realize that there was genetic testing now for HD (Huntington’s disease). There’s been new developments since I first learned about the disease 20 years ago. 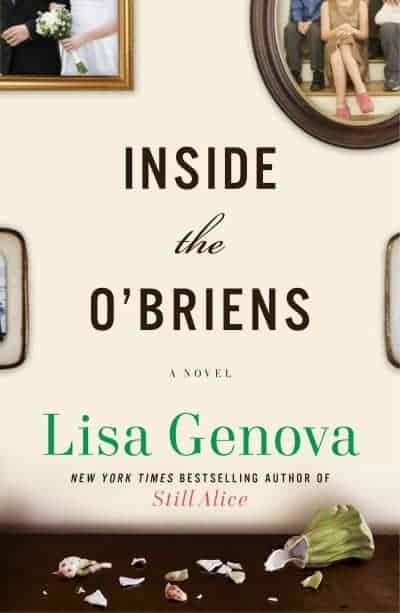 Inside the O’Briens is about working class Irish Catholic family in Boston. Joe and Rosie’s children are grown and in their 20’s, but all still live at home. Their home is three stories so it’s big enough for everyone to fit. Joe is a police officer with the Boston PD. We are introduced to Joe before his diagnosis of HD and follow along as he develops symptoms of the disease that will eventually take his life. HD is truly horrible. A diagnosis is a death sentence. I learned more about the symptoms and how it takes over your entire body. You lose control of all your muscles, but still maintain your mind. It’s like being trapped in your own body. I can’t even imagine. The book goes into more detail about HD, but explains in it a way that is relatable. Not once did I ever feel like I was reading a textbook. Instead I wanted to learn more about it to try and understand what Joe was going through and what he would soon be facing. I think the author did a great job explaining it in terms that a layperson could understand and grasp the seriousness of this fatal disease. The book is not only about the disease itself and Joe’s progression. It’s also about the familial aspect of the disease and how it has affected Joe’s children and his wife. Joe’s wife has the potential to outlive her entire family. That hit me hard and I really felt for her. Joe’s kids have the option to find out if they carry the HD gene and they have their own internal debate of whether its better to know or not know. I honestly don’t know what I would do if I was in that situation. The book alternates between Joe and his 20 year old daughter, Katie’s perspective. Katie has her own set of issues and struggles with the decision to find out. My only complaint about the book is the ending. I just couldn’t believe it ended that way! I can see why the author did it and maybe you’ll like that she ended it that way. Even though I didn’t care for the ending, I still really enjoyed the book. Keep tissues close by when you read this emotional book! You may need them a few times. Other Lisa Genova novels that I’ve read in the past include Left Neglected and Still Alice. I first learned about Huntington’s in junior high – I read a teen book. I loved Still Alice so I’d definitely pick up this novel! Great review, thanks! I can’t imagine what it is like to find out you will likely get Huntington’s disease in the future. I would want to do the test but it would be so difficult! I can see this book making me cry too! This book sounds very sad, definitely not something I would read, I don’t like to read sad stories and I don’t like to see sad movies. Thank you for sharing this review. Just got this book and am so looking forward to reading it. I am a fan. i was listening to it on a book on cd, and thought maybe i was missing a cd when it just ended abruptly…thought i wouldn’t enjoy it as much as Still Alice when it began, but stuck with it. Still didn’t like it as much, but it got better.